Core Research Project "Anthropological Studies of Materiality" Core Research Projects "Anthropology of Heritage: Communities and Materiality in Global Systems"
*Please replace 'at' with @ and send. European and Japanese governments, since the late 19th century, have developed regimes to protect their own cultural properties principally by keeping their form constant. Such regimes are based on the idea that maintaining the forms over generations also maintains its “authenticity.” This idea applies especially to artistic styles and architectural forms. However, it should be remembered that components are not necessarily identical even if a form is kept unchanged. To preserve paintings and buildings whose materials easily deteriorate, for example, they should be repaired with parts replaced, or should be rebuilt regularly in extreme cases. The balance between change and consistency is an especially important issue for intangible cultural heritage (ICH), which is not maintained by physical repair but through repetition of performance (or the practice of making in the case of craft skills). The settings change over time, so details must be modified to maintain the form. ICH, whose transmission cannot avoid modification, is also known as “living heritage” because all living things change over time. It is common for ICH to appear in situations different from the original. Performance in a novel situation sometimes has a positive effect that conventional repetitions lack: recruitment of new appreciators, or refinement of the performance. On the occasion of the Great East Japan Earthquake, there were many sufferers performing what had been local rituals in other locations all over Japan. Their aim was to restore the local economy and social relations. Change or modification in tradition is often expected of favored. However, change must not fall into disorder. If a performance is profoundly different from the original, the intended meaning and audience appreciation may be lost. For example, changing the location of a sacred performance in order to entertain new outside visitors may negate spiritual significance for the community. Similarly, commercialization of home craft may lead to a loss of quality in the work. Drastic modification that preserves no sign of the original form is obviously a serious issue if the new form is claimed to be old. There is no need to assume that a trade-off must exist between authenticity and change. On the contrary, change may be an authentic attribute of many traditions. Recall the familiar fact that competitive innovation does not necessarily contradict the quality control. What do the heirs of heritage want or need in order to maintain its identity and vitality under contemporary conditions? 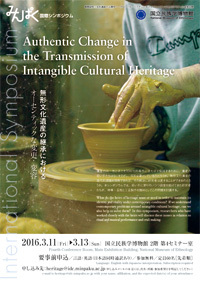 If we understand the contemporary problems around intangible cultural heritage, can we also help to solve them? In this symposium, researchers who have worked closely with the heirs will discuss these issues in relation to ritual and musical performance and craft making.